The ICEfaces extended components provide a mechanism for requesting focus from your application. The focus API consists of a single method, requestFocus(). This method is used to communicate a component focus request from the application to the client browser. The following ICEfaces extended components have implemented the requestFocus method. In order to use the ICEfaces focus API in your application you must use component bindings in your application web pages. The page markup used in this example is taken from focus.jspx. The java code used in this example is taken from FocusManageBean.java. In this example the ice:inputText is bound to an HtmlInputText instance named westText in the application backing bean. In the following example code the requestFocus calls are made in a valueChangeListener which is also implemented in the applications backing bean. Download the focusManage-basic source code here. 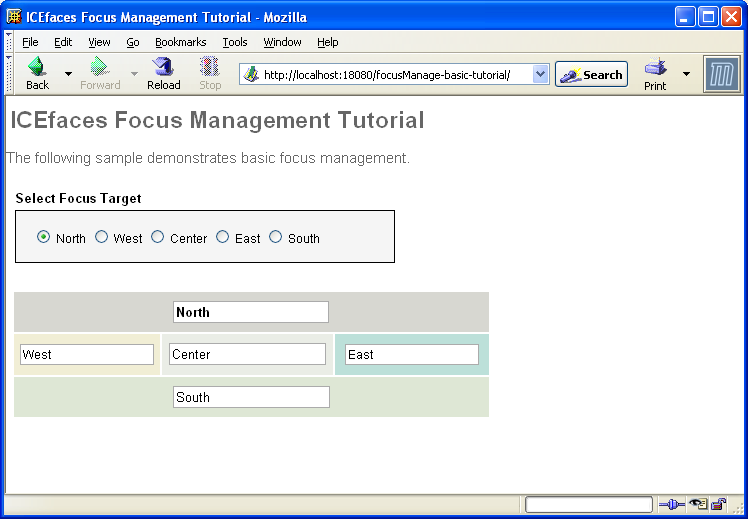 focusManage-basic focusManage-basic source code Simple example of how to use the ICEfaces component focus API in a backing bean.